While there never really was an era where video cards were small, the focus on size and power efficiency over the last couple of years feels a bit like a return to at least some earlier roots in the PC video card industry. After traditional blower style cards peaked at 300W at the turn of the decade while other cards reached as long as 13”, we’ve slowly but surely been backing off on the idea that a large card and a flagship card necessarily go hand-in-hand. To be sure, we still have large cards and powerful cards as these cards have virtues of their own, but with the GPU TDP race seemingly having reached its limit, large and powerful is no longer the one and only path. Instead what we’ve seen is a greater variety in designs, especially as component integration and innovations such as SSDs bring down the footprint on overall computer sizes. MicroATX has gone from a niche to a proper market in and of itself, and at the more bleeding edge previously obscure and performance-limited form factors such as MiniITX have become a viable platform for high-end computing. This in turn has driven video card manufacturers to build designs for these systems, going beyond traditional blower and twin/triple-fan designs. For AMD this shift has been especially evident in their card designs based their flagship Fiji GPU. Thanks in large part to Fiji’s own high degree of integration – HBM brings down the area needed for GPU + memory – the only “traditional” card in the Fiji lineup is the Radeon R9 Fury, which isn’t even AMD’s flagship card. Rather at the high-end AMD went over the top, opting for a high powered closed loop liquid cooling design in what is a reference single-GPU card. Meanwhile at the other end of the spectrum is the Radeon R9 Nano, which sees AMD push the limits on miniaturization and pack Fiji into a card just 6 inches long. 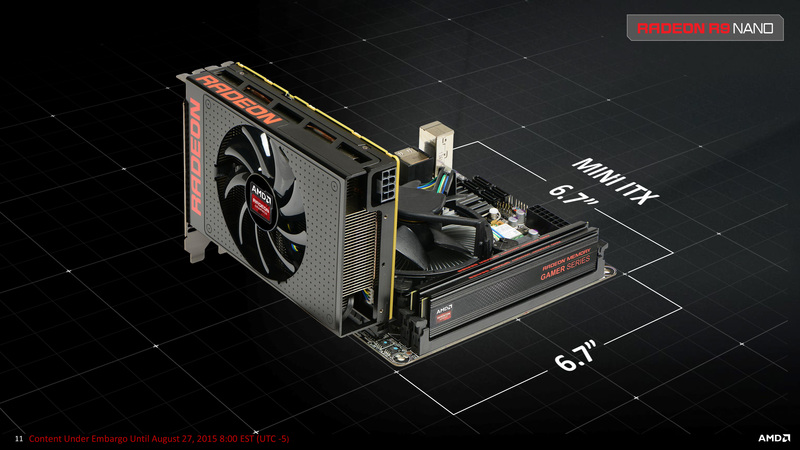 AMD first unveiled the R9 Nano back at their Fury X launch event, and the card was formally announced at the end of last month, with AMD confirming the full specifications of the product along with pricing and availability information. With retail availability finally upon us, today we’ll be taking a look at AMD’s miniscule monster and the niche that AMD is looking to carve out with the card. Since we covered the R9 Nano’s specifications in greater detail back at its formal announcement, we won’t spend too much time here. In summary, the R9 Nano is a fully enabled Fiji part, packing all 4096 stream processors and 64 ROPs. Feeding the 596mm2 beast that is Fiji is 4GB of HBM, the first such use of HBM in the GPU space. 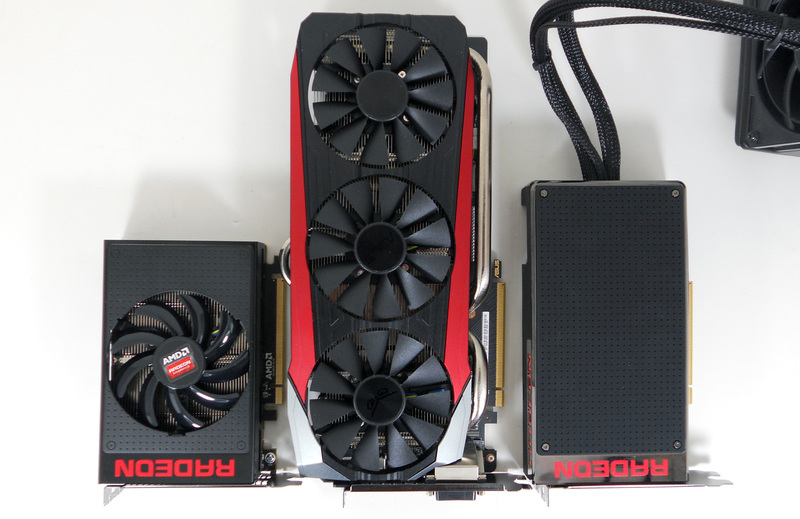 What sets the R9 Nano apart from AMD’s other fully enabled Fiji part, the R9 Fury X, is the size of the card and the intended power envelope. Fury X itself was already something of a small card – thanks to the use of a full coverage water block, the physical card itself was only 7.5” long – however for R9 Nano AMD has pushed to shrink the design even further, down to an air cooled card just 6” long. Meanwhile Fury X’s massive power headroom has been significantly curtailed, from a TBP of 275W (and in practice a cap much higher than that) to a much harder TBP limit of 175W for the R9 Nano. AMD has several reasons for pursuing this kind of a design, the most pure and straightforward of which is the only answer any engineer needs: because they can. Since the Fiji package is only a bit over 1000mm2 and contains the RAM as well as the GPU, it is essentially a form of miniaturization, allowing the surrounding card to be smaller. AMD in turn opted to figure out how much smaller that could be, coming up with a 6” card barely longer than the PCIe x16 connector itself. R9 Nano’s power design in turn is derived from AMD’s decisions on card size. Bringing a Fiji card from 7.5” to 6” meant tightening up the overall design, but also eliminating components and balancing card size against just what a 6” air cooler can handle. 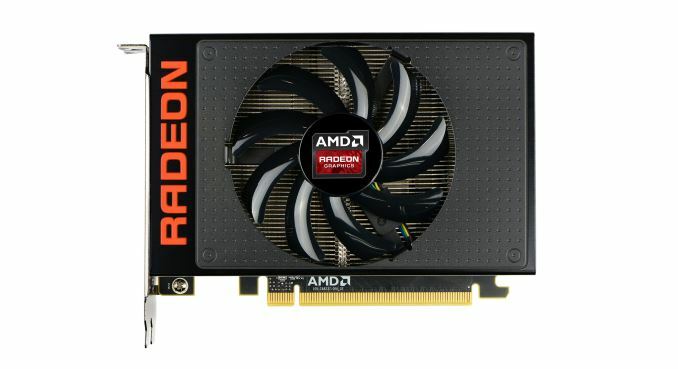 As a result AMD eliminated some of the VRM phases and brought the card down to 175W. Power consumption is going to be just as important for R9 Nano as its size, but as far as the driving force goes, when talking to AMD it’s clear that the engineers first wanted to see how small of a card they could build thanks to HBM. Also motivating AMD has been the matter of what to do with Fiji in a highly competitive market. NVIDIA and their GM200 GPU can give Fiji a run for its money, and by sticking with traditional GDDR5 NVIDIA has more flexibility on using larger memory capacities than AMD does with Fiji. Fiji is a first-generation HBM product, and while AMD is not disclosing the price of the package, there’s every reason to believe it’s not cheap. So for AMD there is a certain need to push their traditional boundaries and use Fiji as a means of entering new markets to defray the high costs of the product. In that mindset then, the R9 Fury series – Fury X and Fury – are the traditional flagship and second-tier cards, offering the full performance of Fiji at flagship prices or offering a harvested version of Fiji at a lower price. R9 Nano on the other hand is something else entirely. Because of the lower 175W TBP the performance of the card is power limited, and average clockspeeds are going to be below 900MHz, some 150MHz less than the unthrottled R9 Fury X. So even though R9 Nano packs a fully enabled chip, it’s not meant to compete with R9 Fury X. As a result the R9 Nano is something of a luxury card, but with the concept rolled out in reverse. Instead of building a brand around peak performance, AMD is building a brand around a fast card that isn’t quite flagship performance, but in return is smaller and lower power than any flagship. R9 Nano in a sense is the best of Fiji, with AMD allocating only the most power efficient of their fully enabled chips to this card. The end result then is that with a launch price of $649, AMD is testing the waters to see what kind of market there is for a small and power efficient luxury type card. AMD already knows that the fastest cards can sell by virtue of their speed alone, but to sell a desktop card on the basis of size and efficiency is uncharted territory for the company. For AMD the growing popularity of smaller form factors such as microATX and Mini-ITX are a signal that there’s a market for smaller cards. Meanwhile the market for premium, energy efficient GPUs is a little different. The explosive growth of gaming laptop sales over the last decade are all the proof one needs that such a market exists (high-end laptop margins are things of legend), however as a high-end GPU Fiji is too big and too powerful even for bulky laptops. As a result AMD is looking to desktops instead, and this is where R9 Nano comes in. Is there a market for similar energy efficient cards within the desktop space? Moving on, while AMD believes they have a leg up over NVIDIA thanks in large part to Fiji, they are not alone in the small form factor space. While NVIDIA does not produce any reference designs in the same manner as R9 Nano, NVIDIA’s partners do, with several partners producing similar Mini-ITX sized based around the GTX 970. This is not strictly a fair comparison since even at 175W Fiji is going to run well ahead of GTX 970, but then GTX 970 is also cheaper and designed to draw less power, and of course NVIDIA’s partners aren’t going the luxury route with these cards, keeping prices much lower as well. As a result there’s no direct competitor for the R9 Nano within the Mini-ITX space. But the moment you leave the niche of cards that can fit within the width of a Mini-ITX board (170mm, or ~6.69 inches) the field widens immensely, and everything from the GTX 980 Ti to the R9 390X is potential competition for the R9 Nano. Which for AMD is why power consumption is just as important as size, as they would like to sell the R9 Nano as an upscale, power efficient alternative to any of those cards. Finally, let’s talk about the launch and availability. This is a pure reference launch and AMD has been stockpiling chips and boards for R9 Nano for some time in order to build up a supply for today’s launch. Overall availability of Fiji products has been very hit-and-miss so far – as of this writing R9 Fury X is out of stock at Newegg once again – and while AMD is projecting optimism about R9 Nano supplies, as AMD isn’t disclosing numbers there’s no real way of knowing whether R9 Nano will stay in stock. On the positive side we’re hearing murmurs that the Fiji supply situation is improving – this being the likely bottleneck for the card supply – so with any luck for AMD things will be getting better going forward. New review on a hardware review site, comment section full of bitching.